Our hallway has been neglected for way too long. There is just too much space to not hang something on the walls. 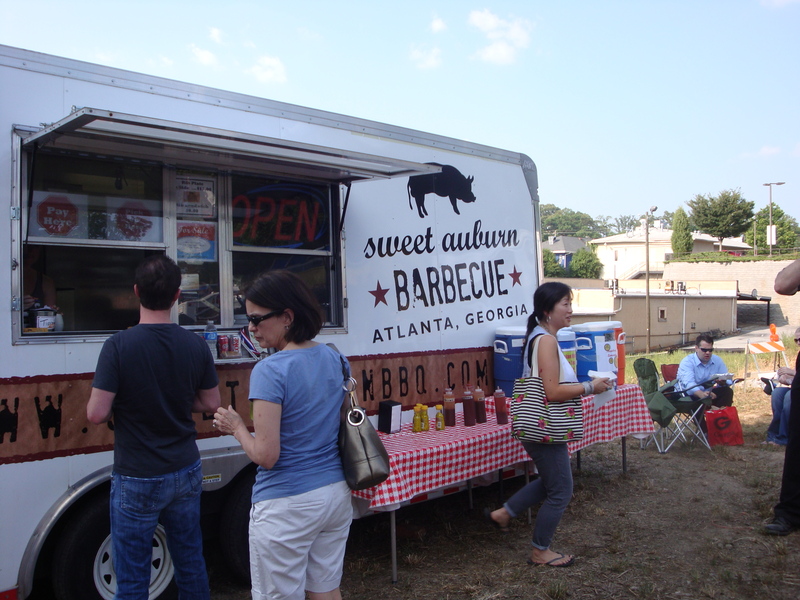 We wanted to be able to stand back and look at the places we have visited, and places that we would like to visit while we are in Georgia. We found a road map travel atlas in Target for $2.00 and hung up the states that surround Georgia (states we would most likely visit) on a few cork board squares. I used Command 3M Velcro Strips since the ratings of the cork squares that I used had a bad review on the double sided tape that came with them. Plus 3M is awesome when living in the college apartments since we can’t make any holes in the walls, and when we are ready to remove the cork squares, the 3M product comes right off without messing up the wall. Red push pins are for places that we have already been to while the black pins are places we are planning to visit soon. It’s a neat way to look at how much of the state of Georgia we have already covered and how little of the middle and panhandle of Florida we have seen. This little project kind of reminded me of something I would have done in high school, but I found it fun and helpful for us to think about new places for quick weekend trips. We still have to add the Tennessee map and a few other little details that I have thought of to make the wall more personalized and eye catching. Hopefully we won’t take six months to complete the wall, stay tuned. A little late, but Happy Summer! So many different colored flowers have popped up in the last few weeks. We have even opened our windows on a few breezy days to hear the cicadas. It reminds us of our travels in Japan during the month of August where the cicadas were very abundant. Here though, they make a different sound, a definite mark of the start of summer. Luis and I have been busy getting things together for my mom and aunt’s visit and preparing for our first Fourth of July celebration here in Atlanta. Still trying to decide on whether or not to watch the fireworks from Centennial Olympic Park or from our parking lot deck since we live only a few blocks from the park. I made a test run of some lemon poppy muffins while we worked on a few projects around the house that have been put on the back burner for the last few months. The muffins came out great and perfect for the summer. Speaking of summer, the summer sunsets are amazing here. Until tomorrow for our hallway project, have a great summer Sunday! Luis and I can’t get enough of this place! We have been to this restaurant at least three times in the past two weeks. I am not sure if it’s because it is so close to our place or because of the awesome “fishbowl” drinks they serve, which this girl is in need of on a Friday night after a long and hectic week at the office! We heart Zen on Ten Asian Bistro & Sushi Bar. I am not super happy with the portion sizes, but it’s the best tasting sushi that we have had so far in Atlanta, not that we have ventured very far in exploring sushi restaurants. 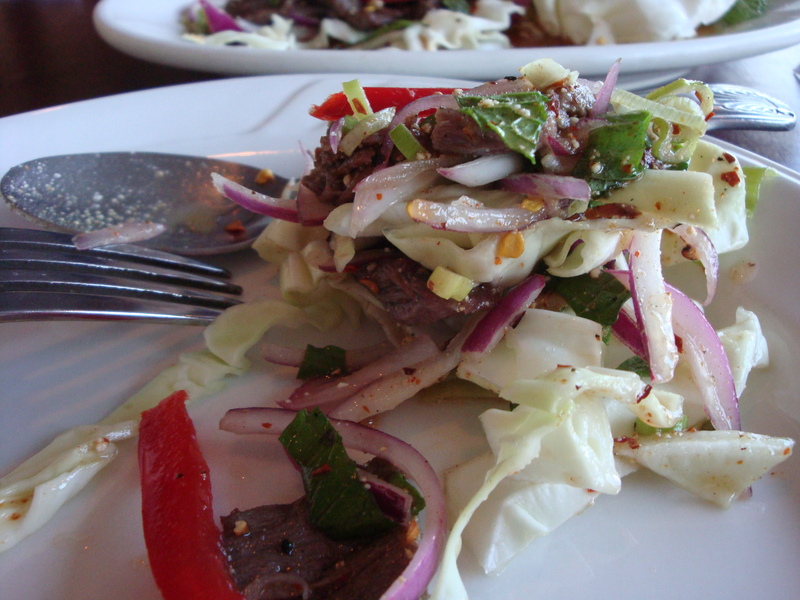 My favorite beginner dishes; cucumber salad or a seaweed salad with Tuna Tataki. And our favorite roll, the Yummy Roll. I also really love the design of the restaurant, it gives off an organic, and cozy feel. I just wanna steal those lamps! On a side note, I have been lacking in posts because it took me awhile to figure out how to upload more pictures onto the blog since I have recently reached max capacity of photograph uploads. I thought it was the end of my blogging experience. Thank goodness for Google and my very smart, but short fused husband to explain to me how to solve the problem and continue on with the blog. This past weekend was very relaxing. Not much was accomplished except for Luis bringing home a Crock-Pot slow cooker, which has been on my kitchen gadget wish list since December. Luis threw in some carrots, squash, onions, chicken, cream of chicken soup, chicken broth, and switched the dial to 6 hours. All that was needed was the rice, which Luis prepared a half an hour before I walked through the door. It was very nice to come home and not have to stand in front of the stove. Such a nice way to complete a crazy Monday; walk through door, eat food, and enjoy. All I need to do now is cross my fingers that the dishes will clean themselves. How did we ever live without a slow cooker? Which brings me to the title of this post. 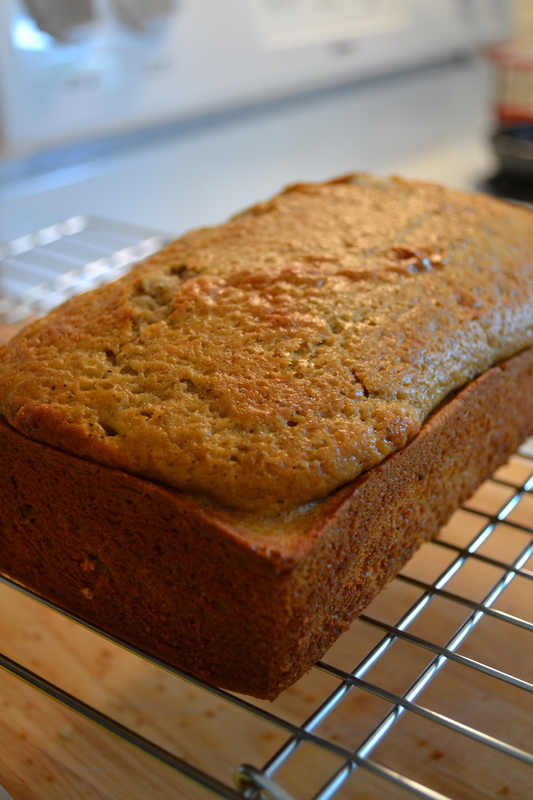 No, I did not bake banana bread in the slow cooker, but I did unglue myself from the couch long enough this past weekend to bake some delicious banana bread for my hubby. I just wanted to share my excitement about our new slow cooker. I should have taken a picture of our awesome dinner that Luis put together for us, but we ate it too fast. Next time. I think everyday of the work week will call for dinner being made from our slow cooker. Could this be a new addiction? 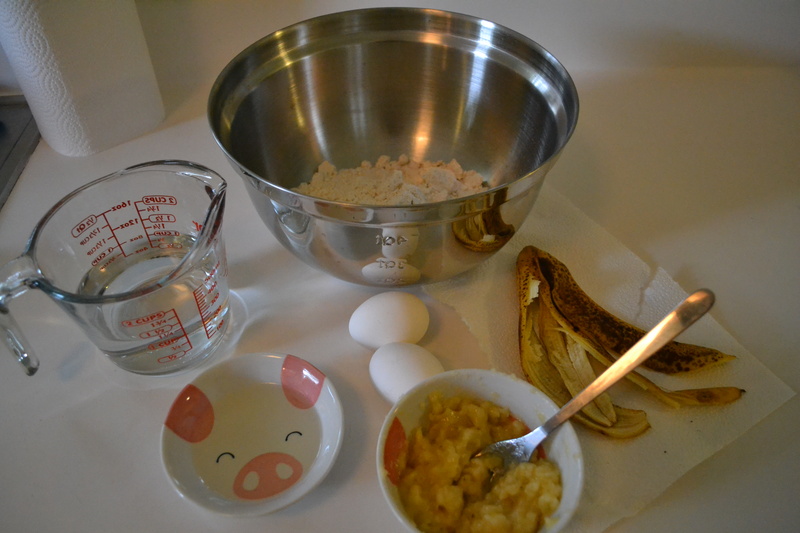 Oh, and the banana was good too! So good that it is already gone. Lemon poppy bread is next on the baking menu. One of the greatest things about visiting my family in the mountains is eating all that home grown and home made jellies and pickles. 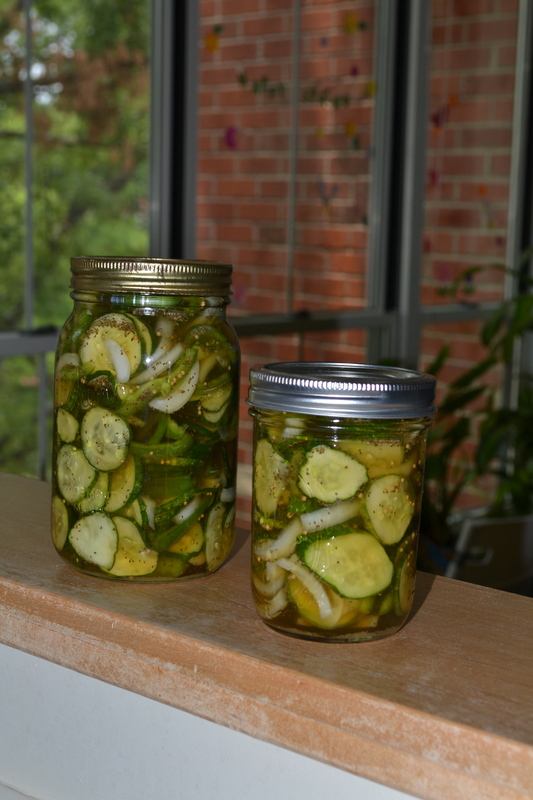 I have never pickled or jarred anything before, but I really love the idea of making something delicious from your own garden or from whatever fruit or vegetable is in season and be able to enjoy it all year. My grandmother makes the best jam ever and whenever I finish that last spoonful, I crave it and wish I knew how to make it. Another item I always miss when I leave my families house is their jarred sweet pickles. 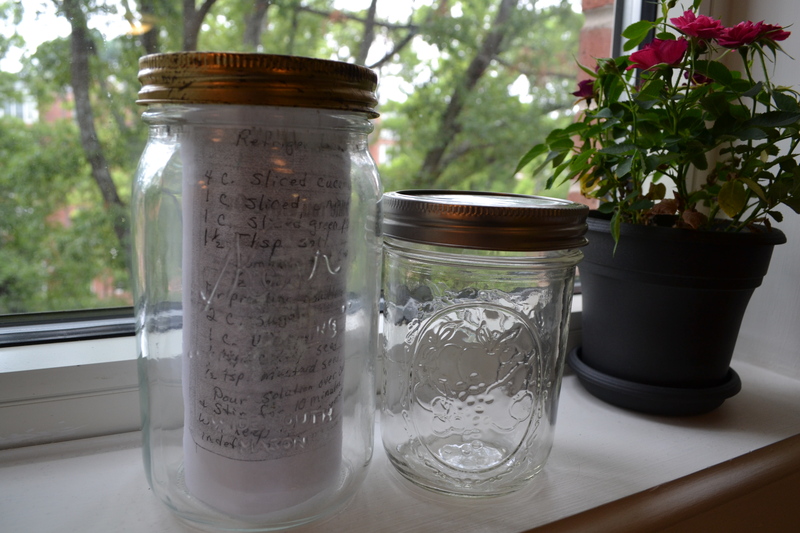 Before Luis and I left to head back home, Gail left me two jars with the sweet pickle recipe inside for me to attempt my first jarring experience. She assured me that this recipe was super easy and my father instructed me on the which of the cucumbers were the best to make pickles. Easy recipe, check! Small, no wax cucumbers, check! 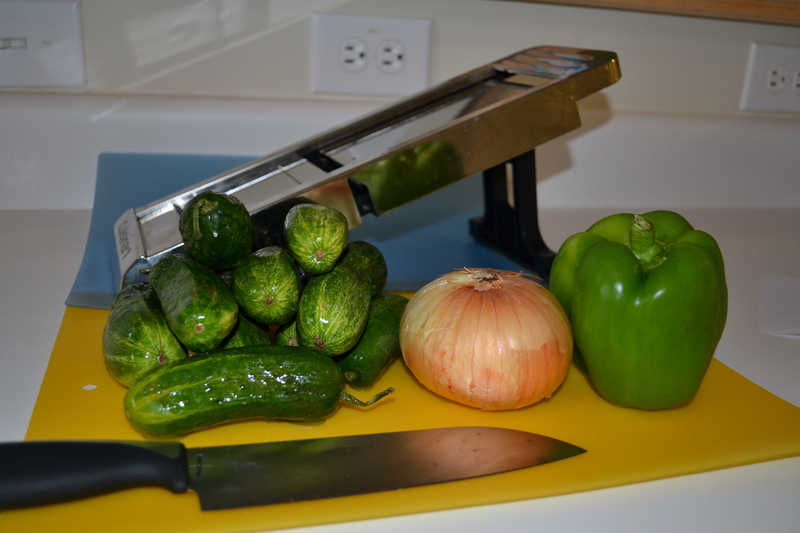 Courage to finally make my own pickles (as of this morning), Check! Plus, I always get excited to use my mandolin. On my last cucumber, I sliced the knuckle of my middle finger on the mandolin. Geesh! I am always so careful, but luckily it was the last cucumber so I was able to add the salt to the mix and let it sit as the recipe said for 30 minutes so I could give my knuckle some love. 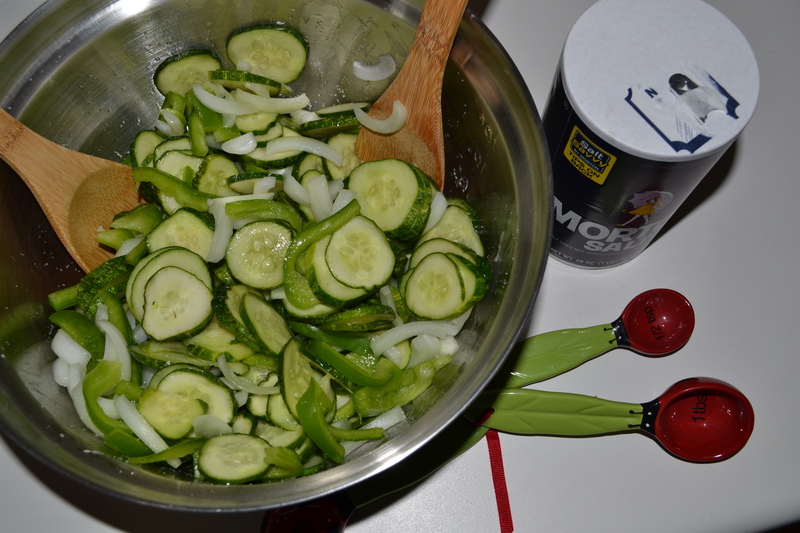 Once my knuckle was all wrapped up, I began to mix together the other ingredients in preparation for adding it to the salted cucumbers. 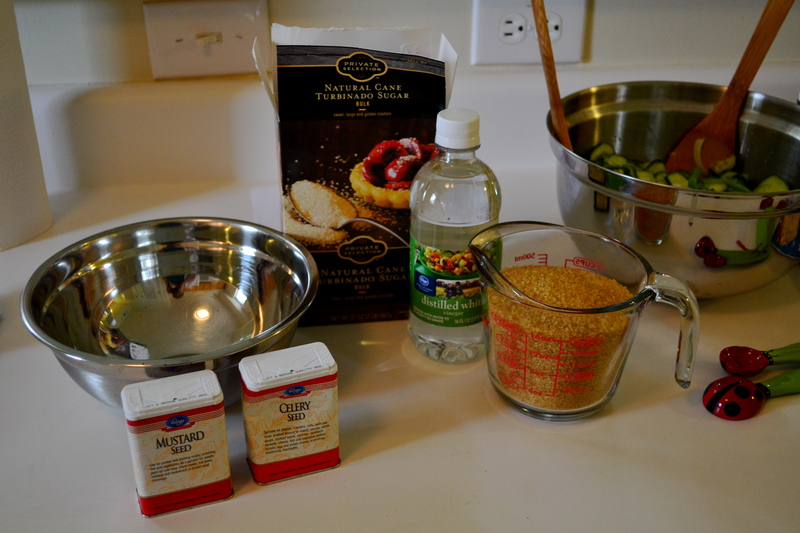 The only item I changed from the original recipe was the sugar. Luis and I have been watching what we eat and working out so I substituted the refined white sugar for natural raw cane sugar. You still get the sweetness that is needed for the pickles minus the actual sugar grams, which makes me happy and my target area happy; my tummy! Look at all that yumminess in those jars! Now it just needs to sit in my refrigerator for 24 hours and they should be ready to eat! Super easy and quick. It is already bringing back memories of my grandfather opening a jar of his sweet pickles, pulling out a fork full and shoving it into my mouth. “Here! Try these! Aren’t they tasty”? Shakes head in the yes motion as mouth is full. I hope mine come out as good as theirs. 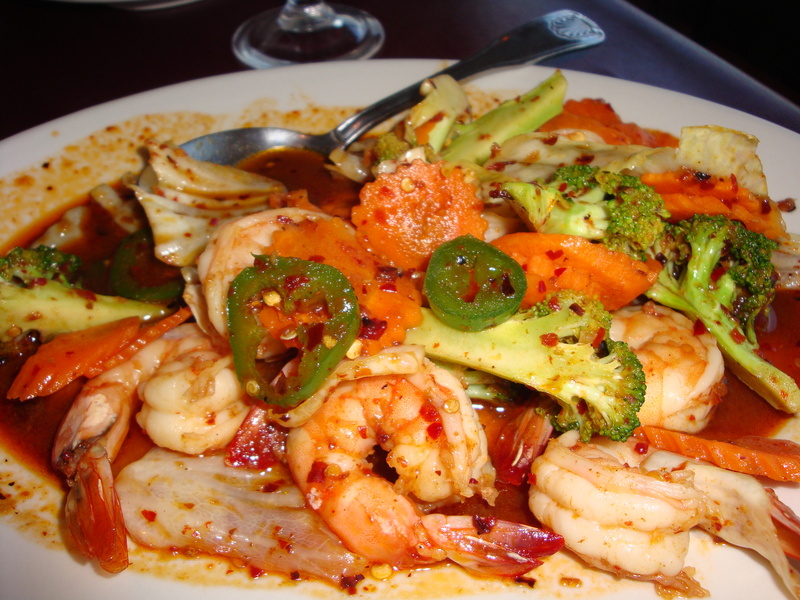 We are still trying to find a replacement Thai restaurant from the one we love and miss in Miami. 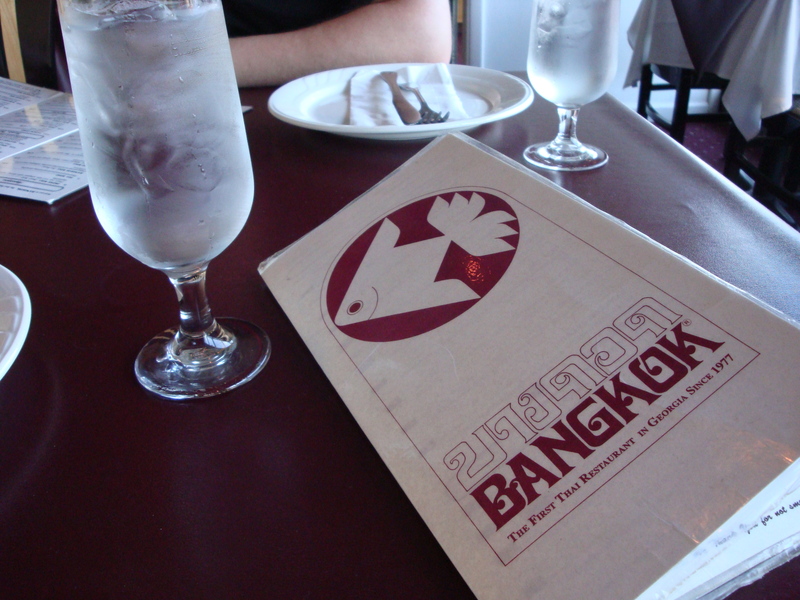 I like the dishes we ordered, but it still isn’t anything compared to our beloved Rock-a-Bangkok. 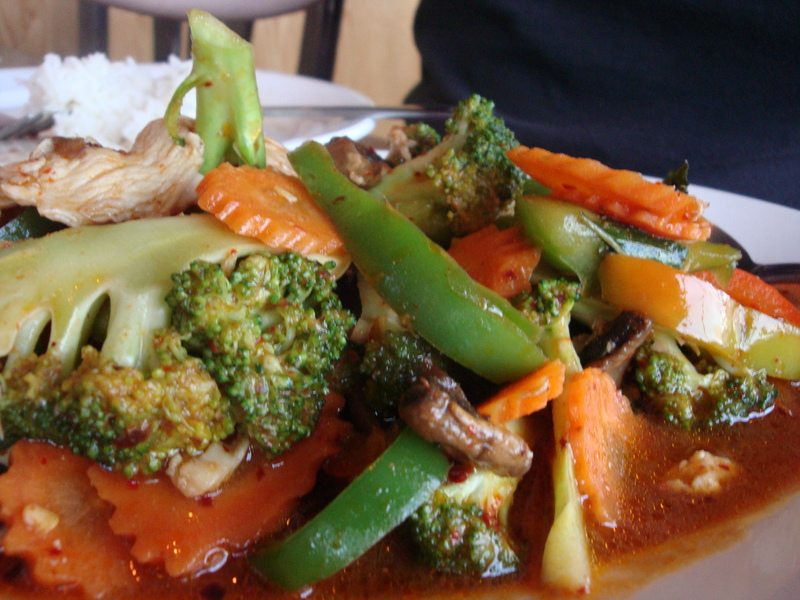 Good thing Atlanta is full of Thai restaurants for us to try. Tags: bangkok thai restaurant atlanta, thai restaurant atlanta, thai restaurants around piedmont park. 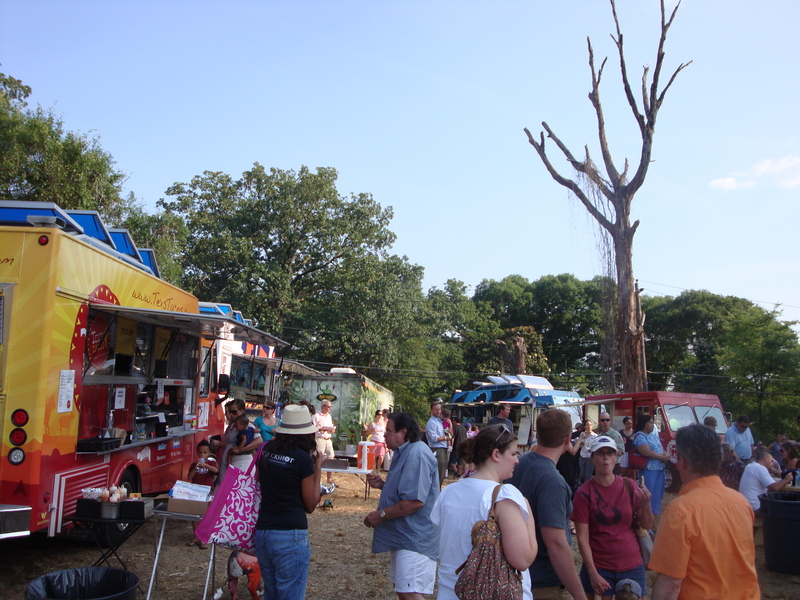 Do you remember me saying that I was obsessed with the food truck coalition here in Atlanta? 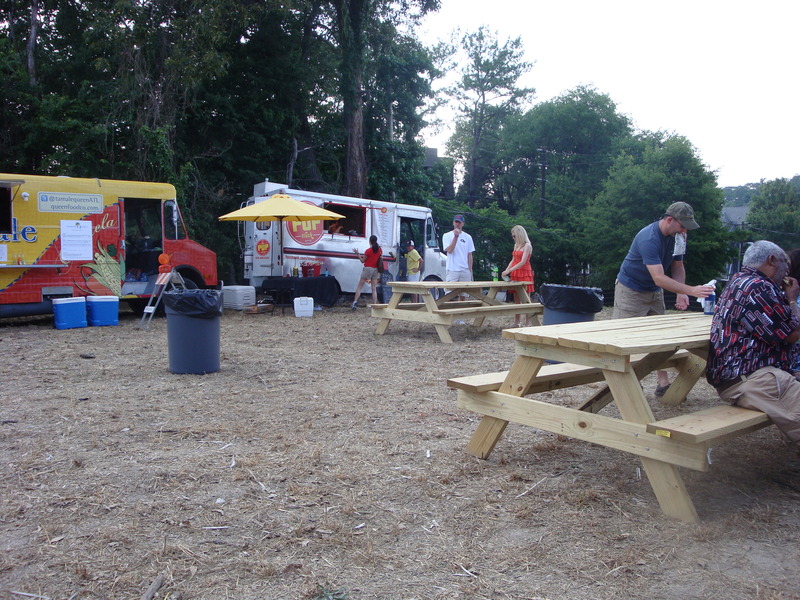 Well, now they have a park, err… empty lot just for food trucks. 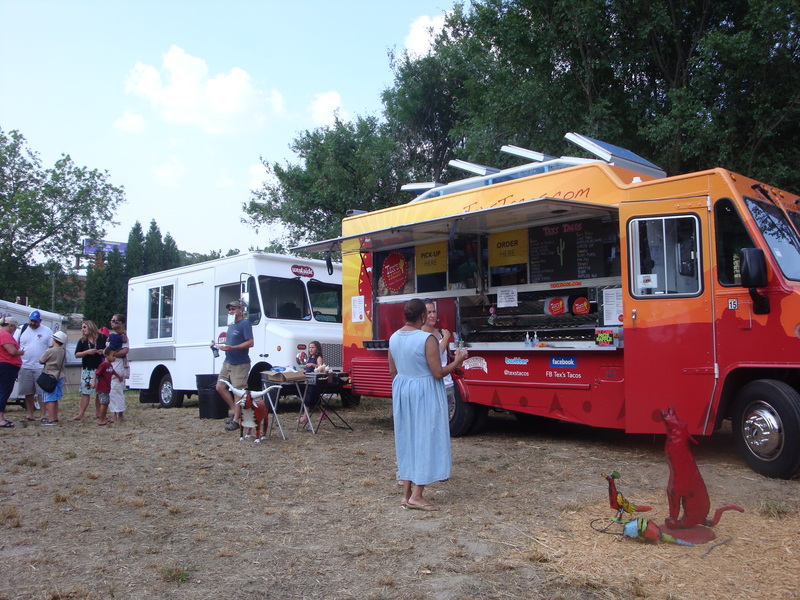 This make me happy since most of the time the food trucks gather at a location too far from my job and usually during the work week. 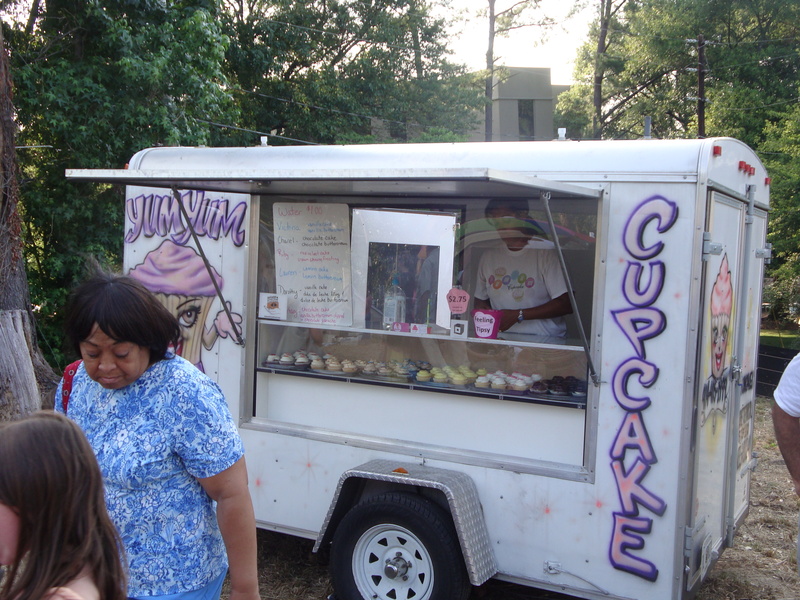 The Howell Mill Food Truck Park gathers weekly and starts around 6:30 p.m. to 10:00 p.m.
Of course I had to have my favorite, Yumbii! 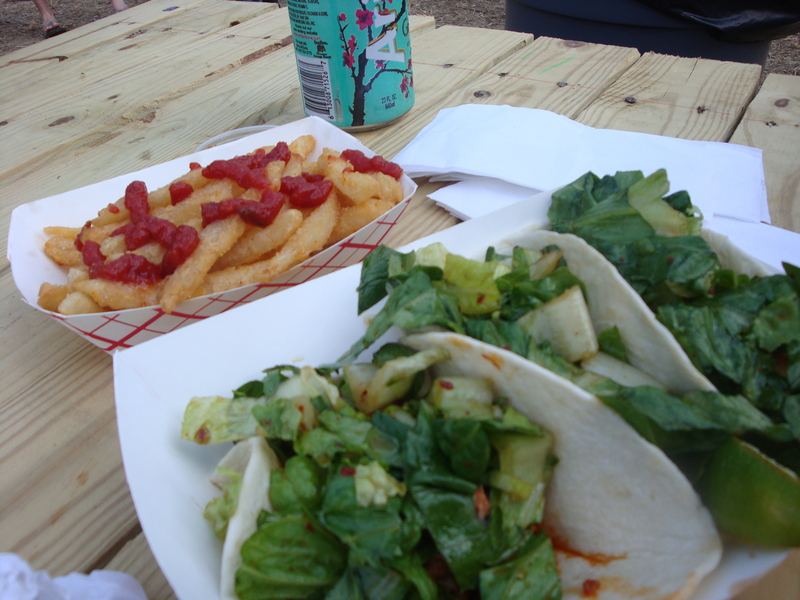 The usual fish tacos with sesame fries and chipotle ketchup. 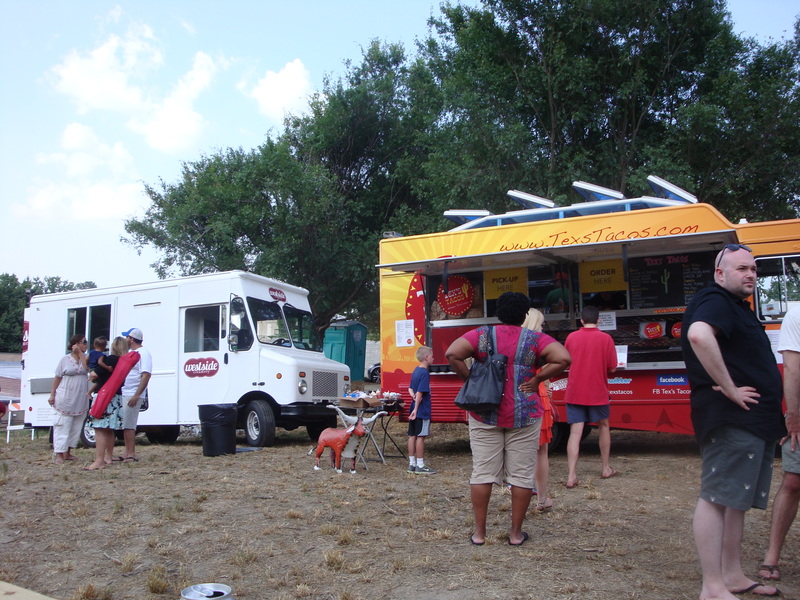 We also tired out a new food truck that also serves up tacos, Tex’s Tacos. Luis had Pastor de Puerco taco; slow roasted pork marinated in chilies and pineapples, topped with grilled onions, pineapple, and cheese. I had the Carne Asada; steak taco. 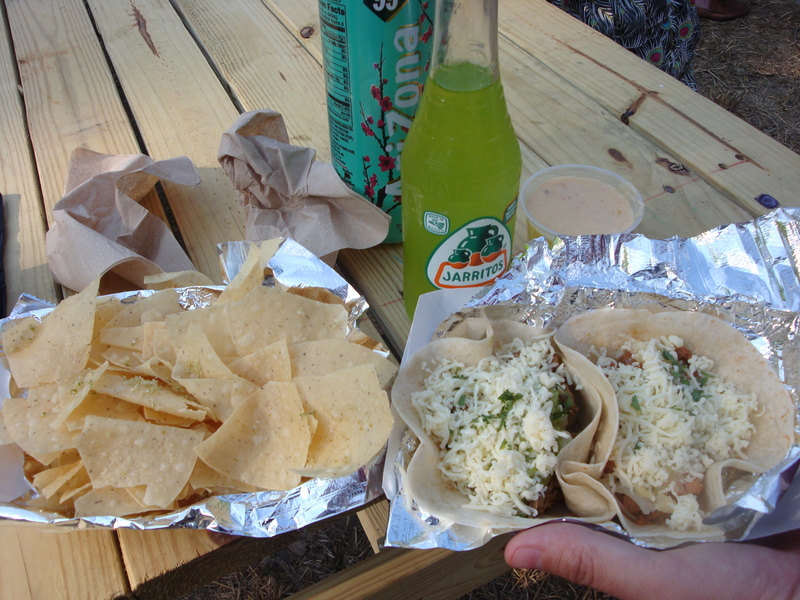 We really enjoyed the tacos, but loved their tortilla chips that are dusted with homemade lime seasoning even more. 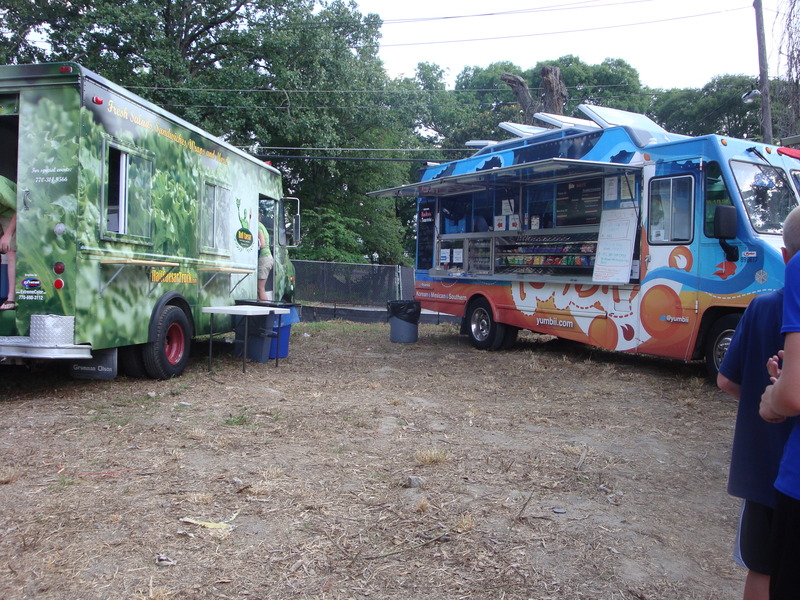 Not going to lie, the main reason why I ordered from this food truck was just to have a Jarritos lime drink. Love that stuff! 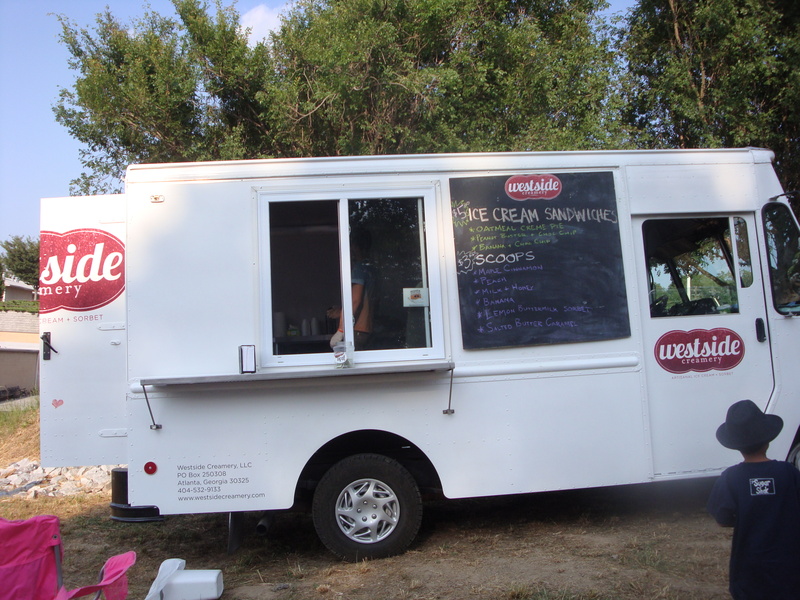 My almost every weekend treat was there too, King of Pops, but we decided to try out a new dessert from Westside Creamery. Luis had a scoop of the maple cinnamon ice cream while I had the salted butter caramel ice cream. 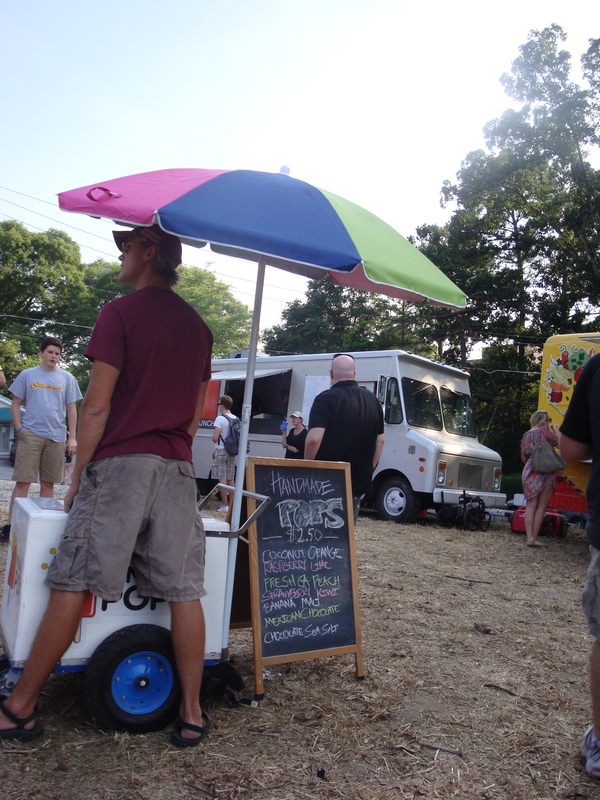 Both did not have a strong flavor and I kinda wished I had grabbed a popsicle from King of Pops instead. Next time, I’m thinking Yum Yum Cupcake! ** Please excuse my blurry pictures as my Cyber-shot that I have had since forever is on it’s last leg, and has not been focusing properly.